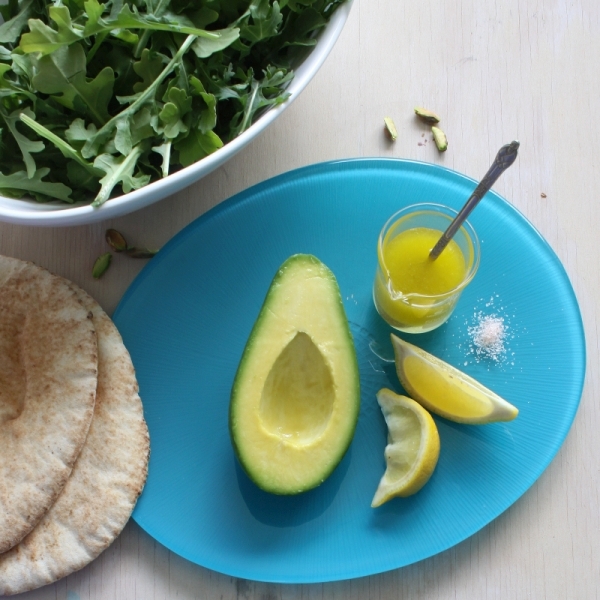 When I made this avocado and rocket salad, my eldest son suggested I call it avocado slammer salad, because of the lemon wedges and little pile of salt on the plate. And when we eat it, it has a certain slammer-like quality – take a wedge of avocado, sprinkle on salt, squeeze over some lemon juice and dressing and then smash onto a piece of flat bread, add some rocket and into the mouth. So good on a hot summer’s afternoon with a glass of cider! It’s just as good served on a plate for each person (and a little more refined), and that’s how I’ve written the recipe below, but I have to say, we more often eat it the former way. It takes but moments to prepare, although it does depend on a gorgeous smooth and ripe avocado to be really great. There’s a funny cartoon I’ve seen with a drawing of seven avocados in a row and underneath them Day 1 – not ripe, Day 2 – not ripe, etc. until you get to the last one which reads Day 7 – gone bad. Like all jokes there is an element of truth in it. Where we live, though, avocados are at their absolute best now so we are making the most of them. In a small bowl whisk together the white wine vinegar or verjuice and olive oil. Place the avocado halves on two plates, then divide the rocket and place next to the avocado. Carefully spoon the dressing into the hole left by the seed and drizzle a little on the plate. Season well with sea salt and freshly ground black pepper and serve right away, with lemon wedges and flatbread. No cooking, hardly any mess, delicious taste, happy you. This is my absolute favorite way to eat avocados, too 🙂 Thanks for sharing!